A series of second half saves from goalkeeper John Danby helped City glean the point required to maintain league football at Deva Stadium for another season. The Blues’s goalless draw with Stockport County means that Mansfield Town will join Wrexham next year in the Blue Square Premier while City live to fight in League Two for another 12 months. This was a battling team effort against a side already assured of a play-off spot, but Danby’s saves, along with the tireless front running from John Murphy, stood out in a night of great tension. The first period produced a bit of a stalemate with both sides failing to create any real clear cut chances, Chester’s only notable effort came from Mark Hughes who headed over from a Murphy knock down shortly before the break. The game sprang to life seconds straight after the restart though with Paul McManus forcing a good save from Conrad Logan in the visitors goal after good approach work had set up the young striker twelve yards out. The visitors, who were forced to field all three substitutes in the opening period, responded well. Adam Proudlock twice forced Danby into saves, the second saw the keeper rushing out to block with his legs when the County player had been sent through one-on-one. City forced several corners but were caught on the break from each by a pacy Stockport attack. John Murphy saw a glancing header from a James Vaughan free kick saved low down on the line by Logan before dandy produced a stunning point blank save from Anthony Pilkington nine minutes from time as he palmed a header onto the bar and over for safety. Three minutes of added time, in which the Blues twice conceded free kick’s on the edge of their box, were endured by the nail biting home crowd before referee Woolmer brought the loudest cheer of the season with his final whistle as players and fans celebrated this priceless point. City entertain Stockport County tonight looking for a point to preserve their Football League status. Manager Simon Davies has injury concerns over two players as both John Murphy and former County player Kevin Ellison are carry knocks. The visitors have already guaranteed a play-off place and may take the opportunity to rest a player or two. Admission to tonight’s game is by Season Ticket or match Voucher only. There is no cash admission at the ground. City manager Simon Davies is to sit down with six of City’s young players in an effort to agree new deals for each. The players in question are defenders Shaun Kelly and Sean Newton, midfielders Glenn Rule and Paul Rutherford, and strikers Chris Holroyd and Paul McManus. All have featured for the first team this season having progressed through the ranks of the youth team. The club have also revelaed that both James Vaughan and Kevin Roberts have signed new two year deals. The following players are all under contract for next season: John Danby, Laurence Wilson, James Vaughan, Kevin Roberts, Mark Hughes, Kevin Ellison, Richie Partridge and John Murphy. Chester’s League Two survival is in their own hands as they enter the final week of the season. The Blues need one point from the two remaining home fixtures against Stockport County tomorrow night and Macclesfield Town on Saturday. A point for City would relegate Mansfield Town who would join Wrexham next season in the Blue Square Premier. Two home defeats would mean that the Stags would have to win their final game next Saturday at Dagenham & Redbridge to survive at City’s expense. Chester ground out a 0-0 draw at Shrewsbury Town on Saturday but wins for fellow relegation candidates Notts County and Dagenham have lifted them both clear of the drop zone to safety. There should be a good following from City as the Blues make their first trip to the New Meadow on Saturday. Chester will be looking for all three points against Shrewsbury Town to pull themselves out of their relegation struggle. Their opponents are only just safe themselves following a poor run that has seen them pick up just one win in 17 matches, that being a recent 3-0 home victory over Wrexham. During that spell they have replaced manager Gary Peters with Paul Simpson. City boss Simon Davies expects to be with both kevin Ellison and Richie Partridge after the pair have recovered from injury. Tony Grant will also be available for selection but Chris Holroyd is still ruled out. Ahead of the game Davies told the Chester Chronicle: “It’s the biggest game for a while for Chester City and we don’t want to be going into that last week because Stockport are going to be flying when we play them. Shrewsbury will be without defender Graham Lee who has been recalled by Doncaster Rovers from his loan spell with the Shrews, fellow defender Kelvin Langmead is also ruled out through injury. The two sides last met in early October at Deva Stadium when goals from Partridge, John Murphy and Simon Yes secured a 3-1 victory for the Blues. Tomorrow’s game is now NOT all-ticket. Supporters who wish to pay by cash on the day though will be required to first pre-buy a ticket from the ticket office to pass through the turnstiles and should allow extra time for this. A youthful looking reserves side ended the Pontins Holiday League Division One West season with a 7-1 defeat at home to bottom side Rochdale at Deva Stadium this afternoon. Andy Mitchell scored Chester’s consolation goal. City finished the season third from bottom of the league that was won by Morecambe. The Shrimps also completed the double after they lifted the Pontins League Cup with a 4-3 win over West Bromwich Albion on Monday. Additional coaches will be running for the all-ticket match at Shrewsbury Town on Saturday. The coaches will leave the Deva Stadium at 12:00 and will cost £8.00. Anyone wanting to travel to the game should contact Barrie Hipkiss between 18:00-20:00hrs tonight on 01244 379011. Shrewsbury Town have announced on their website today that Saturday’s match with Chester will NOT now be all-ticket. Supporters have until 16:00hrs tomorrow (Wednesday) to claim their free voucher for the rearranged match against Stockport County on 29 April (kick-off 19:45hrs). Supporters are asked to take appropriate local identification (utility bill etc ) to the ticket office with them. Supporters are advised that there will be no admission on the night of the game without a voucher and NO cash entry. Goals from Lloyd Ellams and James Gregory gave a youthful reserves team a 2-2 draw at Bury yesterday. The home side featured on-loan City player Simon Yeo. The season comes to an end on Wednesday with a home game against bottom side Rochdale, kick-off at Deva Stadium is 14:00hrs. Yet another League Two defeat for City leaves the Blues perilously close to the relegation zone. City are now just two points above Mansfield in the second relegation spot. The Stags narrowed the gap with a 3-1 win over Shrewsbury Town at the weekend and in doing so also caught up City’s goal difference. Notts County lie level with City and have an identical goal difference but are behind having scored fewer goals. A point below City lie Dagenham & Redbridge. City’s latest defeat came at Wycombe Wanderers when a Scott McGleish goal twelve minutes from time was all that separated the promotion chasers from City. Once again City paid the price after failing to take two good chances to score. City are next in action on Saturday when they make their first visit to the New Meadow to play fellow strugglers Shrewsbury Town, that match is all-ticket. Chester have now notched a staggering 25 games since they last kept a clean sheet!, that was in the 3-0 home win over Barnet in early December. You have to look into the pre-league archives to find a run as bad as this, April 1898 – September 1902 (32 games) and March 1920 – February 1921 (27 games). The worst League record was September 1961 – February 1962 (22 games) although it excludes a goalless draw with Accrington Stanley that was deleted from the records when Stanley resigned from the Football League. Manager Simon Davies is expected that be able to call on the services of Chris Holroyd, Tony Grant and James Vaughan for tomorrow’s important League Two clash at promotion chasing Wycombe Wanderers. All three have recovered from injury and are expected to join the squad. Just four games remain of this turbulent season and City are still looking for points to ensure their Football League survival. City currently lie three places and five points above Mansfield Town in the second relegation spot, and have a game in hand and a slightly better goal difference. The games featuring the other sides in the bottom five tomorrow see Notts County travel to Wrexham, Dagenham & Redbridge visit Rotherham and Mansfield entertain Shrewsbury. The Chairboys are seeking a promotion place and currently lie seventh, the last play-off position, following a midweek win at Grimsby Town. They are unbeaten in five matches. A win tomorow could see them cement a play-off spot should Chesterfield not beat Darlington. Striker Leon Knight misses the game through suspension. City fans watching the match tomorrow will not be in their usual spec behind the goal. Wycombe are designating tomorrow as a ‘Celtic Day’. The home side have strong links with the Scottish team with manager Paul Lambert still regarded well at Parkhead. Neil Lennon, Rab Douglas and Steve Guppy all played for the Bhoys while former Wycombe boss Martin O’Neill was one of the Scottish Premier League club’s most successful managers. Wycombe are encouraging Celtic fans to support their side and have allocated the usual away seating to them. Chester fans will be given a section of the BCUC Stand. The sides last met in October 2007 when goals from Chris Holroyd and John Murphy helped City pick up a point from an exciting 2-2 draw. Two days after the City manager announced that: “Both Paul and Tony have been suspended by the club after a breach of club discipline” the PFA have announced that this apparently isn’t the case: A spokesman for the Association has staded: “The PFA can confirm that following discussions with Chester City FC club officials, Paul Butler and Tony Dinning have not been suspended, contrary to media reports.” It appears that the duo have been frozen out from partaking in any further matches this season. The reserves were beaten 2-1 at Wrexham tonight. The side, consisting mainly of the youth team, found themselves 2-0 down at the break. Despite a spirited second half showing they only had a Paul Smith goal to show for their efforts in the match played at Buckley..
Butler was signed last summer and has made 38+0 appearances scoring two goals this season. Dinning, who signed from Stockport County last October scored twice in 22+0 matches for the Blues. Last month defender Simon Marples was given gardening leave after apparently refusing to take a place on the substitutes bench for the game at Darlington. A young reserves side lost 2-1 tonight away at Morecambe. City’s consolation goal came in the last minute through Lloyd Ellams. The side are next in action on Wednesday with an away game at local rivals Wrexham, kick-off 19:00hrs. Chester suffered their 13th home defeat of the season on Saturday after they contrived to miss a host of chances, including one from the penalty spot, during the afternoon before surrendering an early lead to lose 2-1 to Lincoln City. Worringly the defeat leaves City just five points above the relegation zone with just four games remaining. Two of those remaining games are against play-off chasing opposition in Wycombe Wanders (A) and Stockport County (H). The Blues had been given a dream start in the fourth minute when they were awarded a spot-kick following a foul by goalkeeper Alan Marriott on John Murphy in the area. Last weeks penalty hero Kevin Ellison stepped up but his weak penalty was easy saved by Marriott who hardly had to move. Sixteen minutes later through Paul McManus pounced to socre his first senior goal for the club after receiving a through ball from Paul Rutherford. The lead lasted less that a minute as Jamie Forrester notched an equalised and compounderd City’s misery three minutes later when he ghosted in at the back post to score thesecond following a flick-on from Dany N’Guessan. The visitors were reduced to ten men after the break with N’Guessan receiving his marrching orders following a second bookable offence. Time is running out for City to claim three more points that should guarantee league Two safety. They travek to Wycombe Wanderers next on saturday. The Chairboys currently occupy the last play-off spot following their 2-2 draw at leaders MK Dons on Saturday. City have yet to win in six visits to Adams Park. It’s just been announced that the away league Two game at Shrewsbury Town at the New Meadow on Saturday 26 April is to be all-ticket. Tickets go on sale at the Deva Stadium ticket office today from 10:00 to 16:00hrs and will also be available after Saturday’s game against Lincoln City. Prices are Adults: £15.00 and Concessions: (Over 65, students with ID, under 16, disabled) £10.00. The Blues entertain Lincoln City tomorrow knowing that three points against the Imps will go a long way to securing League Two football at Deva Stadium again next season. City manager Simon Davies will once again be without several key players for the important clash. Richie Partridge and Paul Butler are both expected to be out after picking up injuries last Saturday in the 2-2 draw at Edgar Street. Chris Holroyd has a heel injury and will once again miss out as will Tony Grant who has a hamstring injury. It remains to be seen whether defender James Vaughan who has been struggling with a hamstring injury is risked. One player returning to the squad following suspension though is Tony Dinning. Lincoln are manager by former Chester favourite Peter Jackson. Jackson is currently away from the club as he undergoes treatment for throat cancer, I’m sure all City fans will wish him well and a speedy return to football. The visitors will be without Lenell John-Lewis through injury, while Scott Kerr is suspended. Shane Clarke (Achilles) and Paul Green (hip) are rated as doubtful for the match that kick’s-off at 15:00hrs. Chester are looking to do the double over their opponents following a 1-0 win, thanks to a Dinning penalty, at Sincil Bank in November. The game, Jackson’s first in charge for Lincoln, will be best remembered for its very late 20:40 kick-off time after the City team coach had been held up in traffic. A reminder that all home supporters attending tomorrow will be given a free ticket for the rearranged home game against Stockport County on Tuesday 29 April, kick-off 19:45hrs. The weekly Evening Leader video diary from manager Simon Davies is now online. Two goals from Lloyd Ellams helped the reserves to notch a 2-1 victory away at top of the table Preston North End this afternoon. The side are next in action on Monday with an away fixture at second placed Morecambe. The rearranged home game with Stockport County will take place on Tuesday 29 April, kick-off 19:45hrs. Once again the West Stand is given over to visiting supporters. City fans who attend this Saturday’s home game against Lincoln City will receive a free ticket for the County match. West Stand season ticket holders should take their season ticket book to the ticket office window before the Lincoln City match, there the club will remove Voucher E and exchange it for a ticket for the Stockport County game. Stockport have been given a free allocation of 2,000 tickets for the occasion. City staged a great second half fight back at Edgar Street on Saturday to glean another priceless point towards their fight to remain in League Two. Trailing 2-0 at the interval, a superb 25-yard strike from Kevin Sandwith on 68 minutes, and a coolly take injury time penalty from Kevin Ellison, following a handball in the area by John McCombe, brought City a share of the spoils that seemed unlikely at the break. The home side had taken a two goal advantage with Ben Smith shooting in the first from close range before Gary Hooper raced through to score a second with players and fans appealing for offside. The point put a dent in the hopes of their opponents who are looking to achieve automatic promotion under manager, and ex-Chester defender, Graham Turner. With other sides around them picking up points City remain 20th in league Two, six points above the drop zone with a slightly better goal difference. The team are next in action on Saturday when Lincoln City visit Deva Stadium, kick-off 15:00hrs. A goal five minutes from time by Jack Rowlands gave the youth team a 1-0 home win over Preston North End on Saturday morning. The victory lifts the Blues two places to fifth in the North West Conference. City travel to Hereford United tomorrow looking for three more points to secure their League Two status. They face a Bulls side that currently lie in third spot just a point ahead of the chasing play-off pack. City’s squad is being stretched through injury and suspension. Manager Simon Davies will be without Tony Dinning who, with last Saturday’s game being abandoned, serves his one match suspension at Edgar Street tomorrow. City will also be without Tony Grant and probably James Vaughan who has a hamstring injury. Up front Chris Holroyd is still nursing a foot injury but Kevin Ellison is expected to return to action after recovering from a knee injury sustained recently at Barnet. 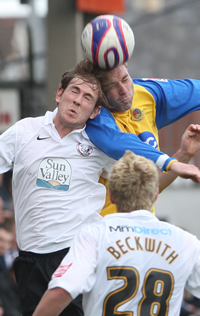 Hereford will be without Luke Webb while forward Steve Guinan may return after a long lay-off through a calf injury. The two sides last met on 12 October when they fought out an entertaining Friday night 1-1 draw at Deva Stadium. City look a second half lead through Simon Yea before Toumani Diagouraga levelled for the Bulls. The football club are holding their Anual General Meeting at the Deva Stadium on Thursday 10 April. The meeting. the first since the early 1990’s!, will take place in the Blues Bar and begins at 19:30. It’s being reported that he rescheduled home League Two game against Stockport County could be played at the Deva Stadium on Tuesday 29 April (kick-off 19:45hrs) subject to Football League approval. Stockport have been given a free allocation of 2,100 tickets for the match. Chester fans who attend the home game against Lincoln City on 12 April will be given a voucher that will entitle them to free admission for the Stockport match. When ever the match is played Season Ticket holders will be admitted in the usual manner. Blues manager Simon Davies says that he wanted Saturday’s abandoned game against Stockport County to have be played out to the end, and has accused County boss Jim Gannon of pressurising referee Iain Williamson into calling the game off. As yet there has been no confirmation of a new date for the fixture. There is also a real possibility that the rearranged fixture could be all-ticket following the overcrowding that marred Saturday’s match.